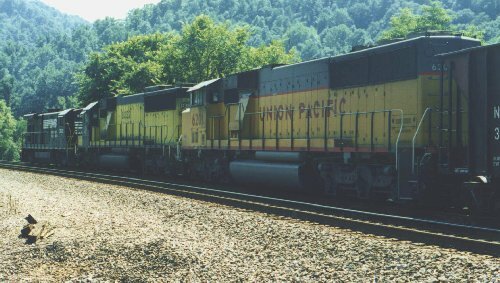 Iaeger, West Virginia and between Williamson and Matewan, West Virginia on Labor Day 1997. A view of Auville yard at Iaeger and how it curves to fit the 'holler' or valley that it's situated in. Two symbols of the past, the concrete coaling tower at Auville yard and a center capoola N&W caboose. A CLEAN Southern Pacific engine!!! 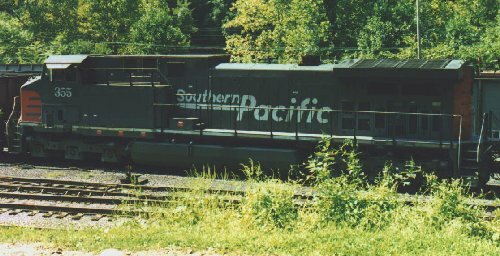 SP number 355, a GE AC44W, is lashed up with two NS GE units waiting for a coal train assignment at Auville yard. A Norfolk Southern GE B30-7A1, 3501, runs long hood forward and leads CNW 8032 and UP 6201 on a loaded eastbound coal train just out of Williamson yard. 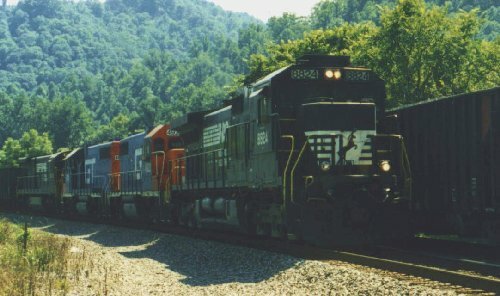 Norfolk Southern 8824, a GE C40-8, leads two Grand Trunk Western GP38-2's, 4922 and 4925, and an older Norfolk Southern GE -7 model on a westbound coal train heading into Williamson yard.